D-Log: Happy Eid, Happy 2007! It's Eid; it's New Year; it's so many good things happening lately! We're having our formal dinner/celebration on Saturday, combining Eid and New Year. The Canada clan are not coming. We're not happy about it and hope it won't happen again! Do you read me guys? We're having friends over to celebrate and have dinner with us; a Chinese couple and an American couple. We'll have roasted "racks" of lamb with mint pesto, rice with nuts, tebahaj, salad, and lots and lots of baklawa and magrood for Sol to dive in! The Eid image above is from a greeting I received from a friend. It is the first time we receive a Eid greeting from an American--Thank you, DeAnne! I just wish the bland/average/white/Christian Americans wise up more and acknowledge other people's Holidays and celebrations and join them just like the others do. It does tick me off big deal that they don't, while on the other hand they get shocked if someone says "We don't celebrate Christmas!" So cocooned in their bubble that they're oblivious of other ways of life and other traditions. They talk about openness, tolerance, and acceptance of the other, but in reality they do it by ignoring the differences. In my opinion, that's adding insult to the injury. I've heard that it is different in other parts of the country, but I have yet to see and experience that. We're all excited about tomorrow. Moody and Tala can't wait to open their Eid gifts; so do I! We'll drop them at the gym tonight for movie night so Sol and I could do more Eid shopping. Eid Mubarak Hannu and family! Hi Hannu, Perhaps cards etc are not sent by us bland/average/white/Christian Americans is that the Muslim religion is a mystery to so many of us. I grew up in Muslim countries and I don't know much at all but I am trying to learn. I think the problem is that Muslims don't openly share there faith and us bland/average/white/Christian Americans and we don’t know the right questions to ask out of fear of offending. I am sorry that you dislike us so much. I hope that one day you might change your mind. And see that we too are all-different and should be judged individually not as a lump sum. I wish peace joy and happiness for you and your family for the new year. You don't have to know the religion of anybody to acknowledge their holidays. All you need to know is that there are special times for them when they celebrate and have holidays. And just like Cristmas is a cultural holiday in many ways and to many people as it is religious to others, so are holidays of other people and faiths. And no, it's no mystery when Muslims have their holidays; it's very well known and talked about at the time all over the news, especially Eid al-Adha. I didn't think you are one of those bland/average/white/Christian Americans, but if you say so, then be it. Also, I didn't lump-sum "you" as you stated. The "average" does not mean "all." FYI, I am one of you; I'm not average, not bland, not Christian, but still an American. And I didn't say I dislike the bland/average/white/Christian Americans; I sure dislike their ways of treating the "others." And I difinitely don't like it when people put words in my mouth! A major reason for the wedge and the lack of "real" tolerance is that people fear to offend. This is totally wrong and it's what ticks me the most. You can't turn a blind eye on my differences and pretend that I am the same as you; you cannot ignore my differences and claim that you respect me. I am different and you have to acknowledge it and accept me with my differences. Listen, I have been sharing Eids and Ramadan with American friends since I came to the US. Not many of those friends care to show they care. Even when we're sharing with them, most don't realize that it's very inappropriate not to throw a holiday wish our way. Coincidentally, the tolerant ones belong to OSU community, and all the intolerant/ignorant ones are those we know outside of OSU community. It surely has to do with the fact that we live in Central Ohio, in a neighborhood that is very white and Christian (typical of Ohio). I get the sense sometimes that those friends feel it would offend their god if they acknowledge our holidays. Please, try to listen to what the different others are saying. Maybe if enough people listened--without digging into the negatives--things would change to the better for all of us. Learning starts with mutual understanding, not throwing accusations. If people with exposure to both cultures can't develop the understanding, then it's very unlikely those who lack the exposure would. I don't get the point of you repeating my words in a comment I left in your blog. If you mean I'm throwing accusations, then please read my post and comments one more time. On the other hand, in your blog, you accused Muslims (collectively) of hating the west; you accused me here of disliking the average American and of stereotyping all Americans. I hope I made my points clearer to you this time! What do you say... we try and learn more about each others culture and the way those cultures thing and interact? We are both (collectively) not seeing things as the other intended. All I want is the east and the west to meet in the middle without killing each other in the process. 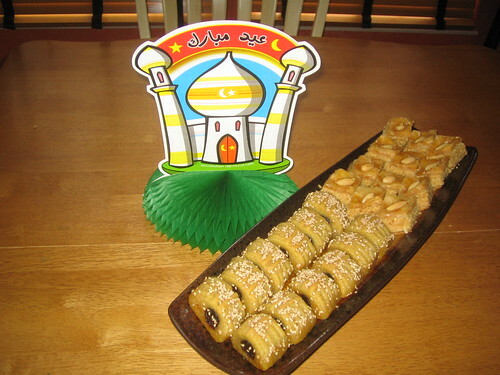 I hope you had a wonderful Eid and the sweets look like a success. Happy 2007 to you all. I am one of those stuck in the middle between the West and the East without really belonging to either. I would be a direct beneficiary if those two worlds find peace. Let's hope it happens in our lifetime! AL, Eid was/continues to be great, thanks! And yes, the sweets were a big success, Sol could testify to that! Best wishes to you and your family for a happy New Year. Happy new year and Eid mubarak. Sorry we couldn't be there to share it with you this time around. We miss you. congratulations Hannu for making this list, well done. Magroud and Baklawa , the best two libyan sweets ,can you send me some? Nikki, happy New Year to you! See you in less than 2 weeks! Thanks Ema and Libyano (welcome back! ), Happy Eid and New Year.